GreyingJay: Thank you everyone for attending, and we hope to see you again next year! Watch for details as we may be trying a new venue. Please remember to log your TB activity if you took a bug that was left in the bucket at the event. Gung Hei Fat Choy - A Chinese New Year Event! Chinese New Year, Lunar New Year, or Spring Festival is the most important of Chinese traditional holidays. 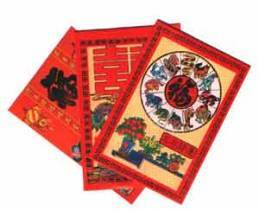 The festival properly begins on the first day of the first lunar month in the chinese calendar and ends on the 15th day. This day is called the Lantern Festival. New Year's Eve and New Year's Day are celebrated as a family affair, a time of reunion and thanksgiving. The celebration was traditionally highlighted with a religious ceremony given in honor of the Heaven and Earth, the gods of the household and the family ancestors. The sacrifice to the ancestors, the most vital of all the rituals, united the living members with those who had passed away. Departed relatives are remember with great respect because they were responsible for laying the foundations for the fortune and glory of the family. The presence of the ancestors is acknowledged on New Year's Eve with a dinner arranged for them at the family banquet table. The spirits of the ancestors, together with the living, celebrate the onset of the New Year as one community. The communal feast is called "surrounding the stove" or weilu. It symbolizes family unity and honors the past and present generations. Probably more food is consumed during the New Year celebrations than any other time of the year. Vast amounts of traditional food is prepared for family and friends, as well as those close to us who have died. February 10, 2013 is the year of the Water Snake. Legend has it that in ancient times, Buddha asked all the animals to meet him on Chinese New Year. Twelve came, and Buddha named a year after each one. He announced that the people born in each animal's year would have some of that animal's personality. Since most Chinese geocachers are probably spending time with their families on the 10th, we would like to spend time with our Geocaching family to talk about caching, and catch up on with one another! Please respond by February 6th, so I can have a general number to reserve one of their seating areas.